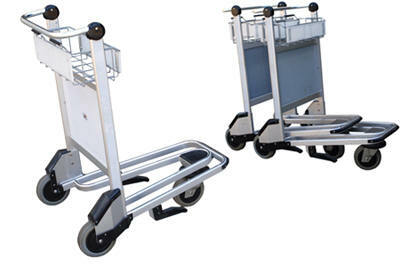 Nestable Multi-Use Cart With Brake This cart rolls easily on its 6" polyurethane wheels. Brakes automatically lock when cart handle is not squeezed. Ideal in airports, malls, shipping and receiving areas. Specs: Uniform Capacity 550 lbs, Overall Size 550 lbs, 26-1/2" x 39-1/2" x 39", Caster Size 6", Caster Type Poly.